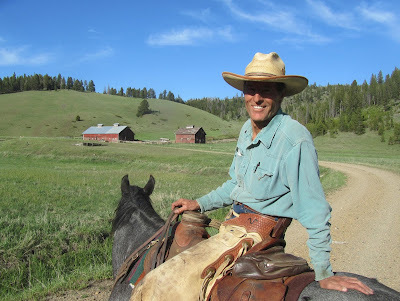 Whit Hibbard, ranch manager at the Dog Creek unit of Sieben Live Stock Company in western Montana. I just had the honor of presenting the Excellence in RangelandManagement Award to my friend and collaborator, Whit Hibbard, at the annual meeting of the International Mountain Section of the Society for Range Management. The annual award goes to someone who is directly involved in managing land in western Montana or Alberta, and who has made a significant contribution to the sustainability of rangelands. Traditionally it goes to a rancher, but not necessarily. Whit is a rancher, and an excellent one—he manages his family’s summer custom grazing operation just west of the continental divide near Priest Pass in Montana. It’s the Dog Creek unit of Sieben Live Stock Company. Whit’s brother Chase previously won the same award for his management of the main ranch, near Cascade, Montana. Whit is also more than a rancher. He has a PhD in Human Science, and wrote his dissertation on transpersonal psychology and integral theory. His greatest contribution to the art and science of rangeland management is as the founder and editor of his Stockmanship Journal. The journal is dedicated to low-stress livestock handling as developed by Bud Williams, and associated aspects of stockmanship. It’s as rigorous a treatment of this subject as can be, without being too academic for the end users of its content. Both cowboys and academics may be surprised by how much can be said about stockmanship with this level of academic rigor. The summer 2016 special issue on Stockmanship and Range Management synthesizes, and is a significant contribution to both of those topics. Stockmanship is an integral part of rangeland grazing management, and for many practitioners may be a (surprise) weak link in their ability to apply strategic or targeted grazing. So how did I—a conservationist and scientist who didn’t grow up cowboying—end up working with Whit, contributing to the Stockmanship Journal, and presenting this award? Strategic or planned grazing is often described as “animals in the right place at the right time for the right reasons”—but how do we actually make it happen on the ground? That’s what I was asking myself when I first began studying range management. I’d get the beginning of an answer from Holistic Management Certified Educator Guy Glosson, in his workshops on Low-Stress Livestock Handling. I immediately saw that was the tool that made planned grazing feasible on a level that could have real impact, but I’m still developing my own skill level. A decade and many workshops later, I had the opportunity to work with Whit on a few projects and writing articles about them, including a couple in the special issue devoted to range management and planned grazing. We collaborated on a couple of experiments at his stocker operation, where we were able to use low-stress herding to kindle the herd instinct of a few hundred co-mingled yearlings, and manage the grazing on a finer scale than with just the existing fences, thus improving grazing distribution. We were also able to night-pen cattle on the range, creating beneficial animal impact, improving land health and forage production. Similar methods would also reduce vulnerability to predation. The Stockmanship Journal special issue combines that with articles by Joel Ham on planned grazing, Steve Cote on grazing public lands, Hilary Zaranek on reducing predation, Wayne Elmore on riparian area restoration, and Jesse Bussard on the Stockmanship Symposium organized by HM practitioner Kent Reeves for the Society for Range Management. Joel, an HM practitioner who is profiled in the issue, dispels some of the myths about what “low-stress” means, and explains that it made the difference in being able to move and place large herds, and that was the weak link for him and many others in being able to apply planned grazing. That was also Guy’s experience, as detailed in a previous issue of the Journal. There has been a lot written about stockmanship in the popular press, but much of it lacks rigor and does not accurately reflect low-stress livestock handling. The academic literature has paid attention to the principles underlying planned grazing, but little attention to stockmanship and—until now—none to the intersection of the two. This issue presents a practical, down-to-earth, yet rigorous integration of stockmanship and planned grazing on rangelands. So I am very honored to present the Excellence in Rangeland Management Award to my friend, Whit Hibbard. The Excellence in Rangeland Management Award is presented to a land manager who has made a significant contribution to the sustainability of rangeland. The special issue of the StockmanshipJournal on Stockmanship and Range Management (Volume 5, Issue 2, July 2016) is available at: www.stockmanshipjournal.com/v5i2/.